We're back in California in a beautiful home you might recognize, the Calabasas Remodel! This project has a lot of before and afters, and today we’re showing you the casita. What is a casita? It's a small space off of a home, a suite that could act as a pool house, office, or guest space. Get caught up with the rest of the Casita spaces by checking out the Outdoor Spaces and Lounge! When you first walk up to the home you'll see the casita with its own private stairway, then walk through a courtyard and into the main house. We wanted to greet all who enter with a calm color palette of white, neutrals, and blues. We started by selecting this cool modern semi-flush mount fixture. The nightstand has this amazing whitewash and a lattice detail on the front that feels cool and coastal. 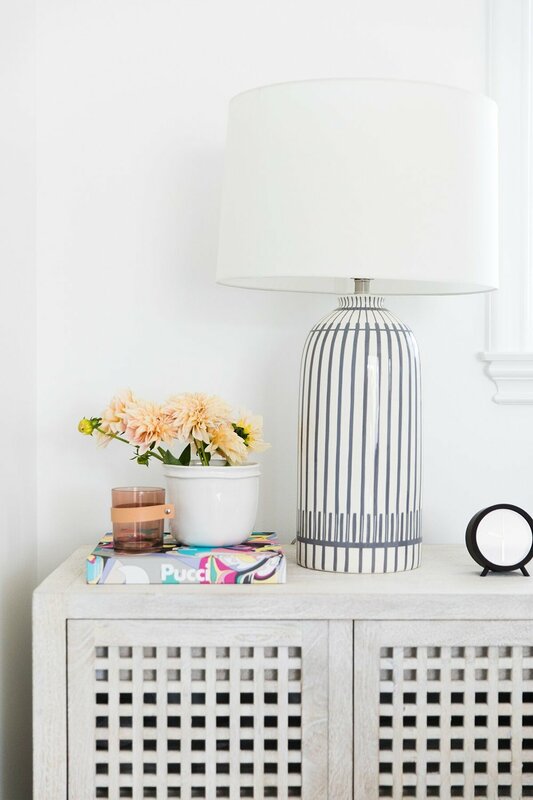 The striped lamps create a contrast that's subtle enough to feel relaxing. We were going for a very coastal feel, but didn’t want it to match too closely, so we mixed woods in the furniture selections. The dresser doubles as an entry console for guests and we styled it with a really cool mirror with a hooked detail that it hangs from, and then a textural white lamp and other neutral accessories. The room is extra long, so we put a little settee at the end of a bed. Our client actually already had one, so we just recovered it! It creates great contrast with the light tones in the bed. In a guest room, adding an extra chair is a great opportunity to create additional seating, display artwork, and it's an easy place to set down your bags. When you walk out these incredible double doors you're in this outdoor space that was just made for lounging!!! Outdoor spaces are a big deal in California because it allows you to take advantage of that great weather all year. 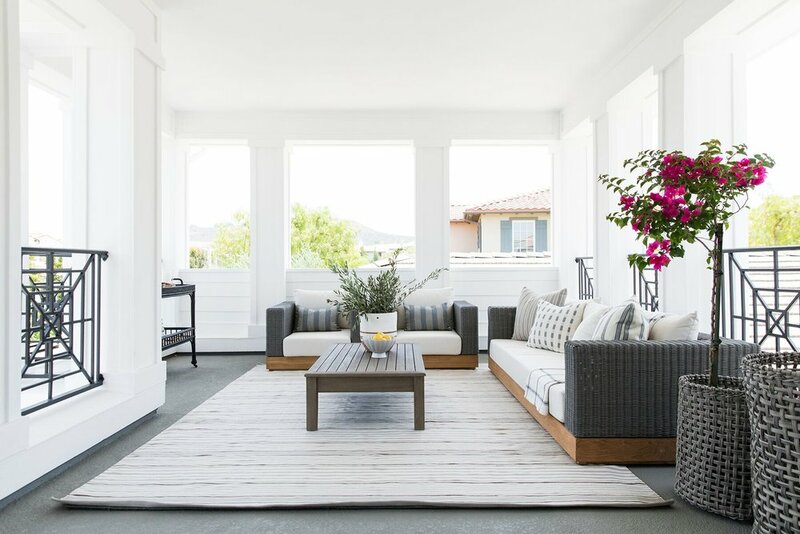 When designing outdoor spaces we always ground the area with an indoor/outdoor rug because you can hose them off to easily clean, but it still makes it feel like a cozy living room. This Rugby Rug was perfect with the color scheme. They had one extra spot in this space that didn't have room for furniture, so we put a little bar cart which is great for entertaining. We filled it with a darling mister, a Hadley pitcher, and Faux Sage. You've heard us talk about mixing and matching furniture pieces, but in outdoor spaces we do it a lot less. We did a matching sofa and love seat, but added in the fun eclectic textiles on the sofas. To create contrast we brought in a different coffee table. Stay tuned because we have two more webisodes from this project! !